The difference between robot-generated art and human-generated art is that human art tells stories. This sonnet generator makes it obvious. Well, we have some potentially disturbing news for those of you hanging your hats on those kinds of declarations. Google recently announced that their Magenta project, which makes use of new hot advances in machine learning called “deep neural nets,” has created a 90-second melody based on the input of four notes. (No word on whether it has made anyone cry, though.) A small competition we ran several weeks ago at Dartmouth College, the Turing Tests in Creative Arts, shows just how close we are to making robots who can make art. Our goal was to challenge the A.I.–interested world to come up with software that could create either sonnets, short stories, or dance music that would be indistinguishable to a human audience from the same kinds of artistic output generated by humans. While we didn’t get many submissions, those that did come in were very thoughtful, especially in the case of sonnets and dance music. The dance music portion compared algorithmic DJ-ing to human DJ-ing. The human DJs were hidden from sight as students listened and danced. After each set, the dancers were asked to guess human or machine; two entries were statistically indistinguishable from the human DJs. This is interesting but perhaps not surprising. All of us, especially those who are college-age, have been listening (perhaps primarily) to computationally inflected and composed music for a long time. This artistic form is one that has already blended into computer-based production; our perception of the nature, and production, and attribution of art and culture evolves with acculturation. In the case of the literary challenges, a panel of judges each reviewed a collection of sonnets or short stories and were asked to pick out those that were generated by a machine. While there were no winners for sonnets or stories (i.e., the judges were able to distinguish the machine-generated sonnets), in the case of the former, the programs were so smart and sophisticated that we couldn’t help but wonder if in a future running of the competition we would have a winner. The sheer number of sonnets an A.I. bot can generate is astounding (countably infinite if you want to get technical!). The winning entry, from a team at the University of Southern California’s Information Sciences Institute was fantastic, and the runner-up from University of California at Berkeley also produced interesting work. anticipation is the throat of song. pulses of the mystic tale no fable. might be like joy the petty billows try. the universe which was either neither. you for love hath stained if to have served by. and many maiden gardens yet unset. alpine flood above the dune stood the grin. So what if an art-producing machine could pass as human? Or more accurately, so what if the output of a program, created by humans, could produce art that an average person would accept as human-generated? This more detailed description is important, for cast in that manner, it reveals the artistic output for what it is—not the thoughtless and mechanistic production of an emotionless entity, but rather a natural next step in the already-rich collaboration between machine and human when it comes to producing art. Yes, that’s right: Machines and humans have been working together to make art for some time. 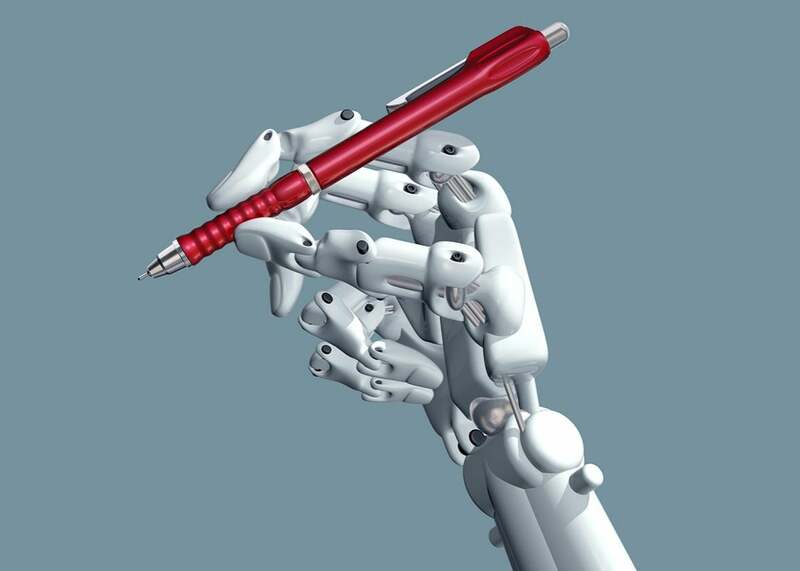 The presence of machine has already been particularly influential in the realm of literary products. When the technology of writing came to be (requiring the invention or discovery of mark-making tools and surfaces to record and store meaningful signs), new possibilities in narrative form arose—narratives where perhaps memorization need not influence the product. Movable type and the printing press was another great influence, then the typewriter, democratizing forces in the creation of literature, bringing new voices and forms to the written medium. Most recently, consider the effects of word processing or “authoring” software on literary production. Who among us doesn’t feel compelled to change things so that we will satisfy Microsoft Word and produce a document clean of its automatically determined infelicitous word choices! Don’t kid yourself, for many of the documents we turn out are already collaborations with machines and, arguably, always have been. Of course, some literary products lend themselves more readily to machine collaboration than others. Short narratives about the outcome of a baseball game can be readily created from a reasonably detailed box score. The same is true of certain financial reports. These kinds of products are in essence formulaic, but the same is true of some forms of poetry like the sonnet. A Shakespearean sonnet is basically a high-level algorithm: three four-line stanzas in iambic pentameter, each with rhyme scheme ABAB, ending with a rhyming couplet. It’s just that for centuries, humans have been the ones executing the pattern. Now, with a good deal of thought and some creative applications of natural language processing principles, a smart team of information scientists can engage a machine as a collaborator. Part of the winning entry sifts through opening words as well as a database of near-rhymes, the latter a tacit acknowledgment that a signature of the human implementation is the ability to not always follow the rules. It’s cleverer than the Microsoft Word Assistant, but is hardly a solitary poetry-creating automation. The human might not be in the loop after the input is given, but the human is surely deeply represented in the design. And that is why it is successful. So what still remains for machines to conquer? One of the judges remarked that the sonnets he picked out as machine-made didn’t seem to be about anything—even if the words all went together well and there were coherent phrases or even fully formed lines around a given subject. In short, what was lacking was a narrative. Narrative is difficult to articulate in an algorithm (but we’ll continue to aim for it in next year’s competition). In fact, as the essence of storytelling, it is arguably one of the most human of activities. Thus, while these experiments surely celebrate successes in the context of human creativity on the computer, in their failings, they ultimately may help us recognize and celebrate what it means to be human.